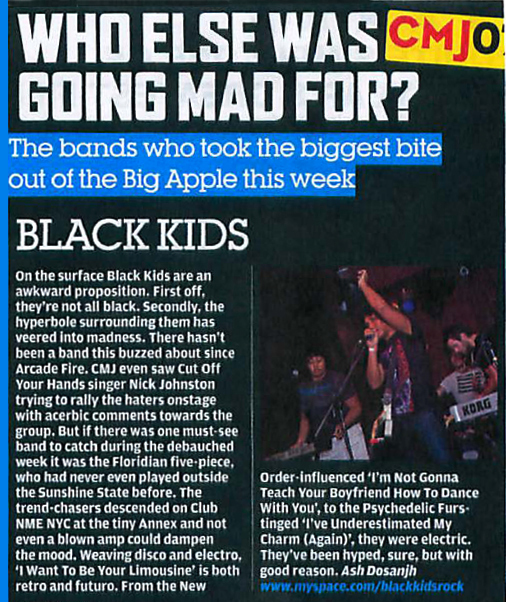 This weekend you have a chance to catch Black Kids in their own backyard (they are from Jacksonville, FL) before they cross the big pond to play shows in London. The interest this band is creating is reminiscent of the The Arctic Monkeys or The Go! Team. And their music is not far off either. Infectious pop songs, girl group harmonies, 80’s synth-pop. I swear I can hear The Cure in the song Hit the Heartbreaks. The ENTIRE Wizard of Ahhhs demo is available for FREE from their MySpace profile. The band is currently unsigned but picked up Quest Management who also handles Bjork and Arcade Fire to represent them. And it seems they will not be unsigned for long. So if you live in South Florida don't miss your chance to catch them LIVE this Saturday (11/24/07 ) at Circa28 for CircaSaturdays. They have already played with the likes of Lo-Fi Fnk and Tiger City and you know we are fans of those bands. More info about Black Kids at their website (http://blackkidsmusic.com/). Here is song where they channel The Cure and a remix not available on the EP. You'll catch me at the show. The Black Kids are actually friends of mine from Jax. When I left there a year ago, they were just starting out, but I knew they'd end up somewhere. Go figure.